When I finished the Breakfast Club series of plant profiles, I said I thought I wouldn't be doing another series like that again, because it was "hard." Which is true: it was. But . 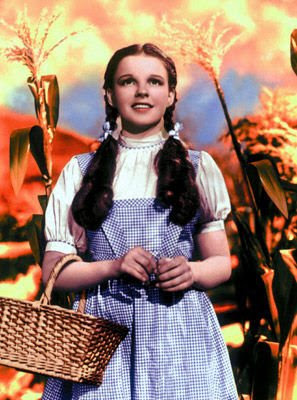 . . sometimes ideas grab me and won't let go,1 and so here we are, at the very beginning of what will become the Wizard of Oz series, beginning with, obviously, Dorothy. 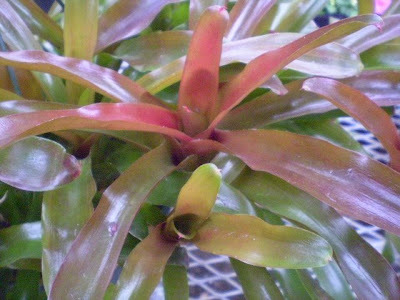 There are a couple reasons why Neoregelia 'Fireball' seemed like a good match to Dorothy. The first, admittedly kind of a stretch, is because 'Fireball' too is familiar with rainbows, if not necessarily what's over them. In high light, it will be vividly red (see pictures); slightly less light gives you orange, and less light still will be green. Orange on the left, green on the right. Both of these are plants I brought home with me from work, at more or less the same time, but only one survived. I don't remember, now, which one of these was the survivor. The other reason is that both Dorothy and 'Fireball' are looking for home, in a sense. The plant probably doesn't care so much, but we don't know where home is for it, or how it got to the U.S., or anything else. You'd think this would be hard information to lose, but I ran into two completely different origin stories in the process of researching this profile, and I wouldn't be surprised to find others. According to The Orchid Thief, 'Fireball' was found in a trailer park in Goulds, Florida, as a seedling growing on an orchid. The owner (not named in the book) then propagated it, set up his own nursery, and eventually made fifty thousand dollars off that one chance seedling. This story is vivid and dramatic and would make a nice short film, possibly,4 but the author (Susan Orlean) doesn't try to verify any of it, apparently, and the lack of details is suspicious, so its authenticity is doubtful. Large work plant in a hanging basket: we've been using it as a stock plant. The alternate story, from here, is that the plant was sent up from South America by Walter Doering (primarily an orchid collector) to Nat DeLeon, a bromeliad collector, from Brazil. The plant was temporarily named 'Fireball' for trading purposes, even though it was collected from the wild and is therefore probably likely to be a species unto itself, instead of being a hybrid or a sport.5 So far, it doesn't have an official species designation as far as I've been able to find, though the link states that occasionally, for no reason the speaker knew of, the plant was referred to as "N. schultziana." 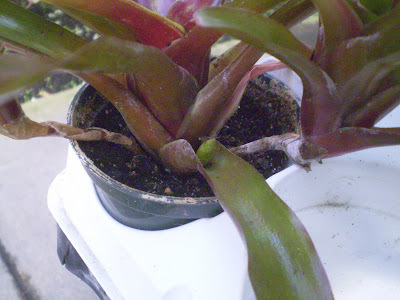 The DeLeon story appears to have more currency in the bromeliad world than the spontaneous-origin one. In any case, even if it's just another bromeliad species from Brazil, we don't know where it calls home specifically, within Brazil, or what its natural role in the ecosystem there might be. We don't even know if there are any left in the wild, until somebody finds some again. Fortunately for the plant, I guess, they're getting increasingly abundant in cultivation, so maybe it doesn't have to survive in the wild anymore. And they're not hard to keep going indoors, either. WATER: I can't say that I've ever seen one react badly to being too wet or too dry either one; at work we tend to keep them fairly wet all the time, which seems to work fine, and at home I do more or less the same watering as I do for any of my plants: I let it get about halfway dry between waterings. LIGHT: This is a plant which will give you feedback about how much light it's getting, more so than most: if it's green, it would like more; if it's green and red, it'll get by; if it's red, it's happy.6 A sunny, unobstructed south window is probably ideal, but I bet it could be grown using only fluorescents too. HUMIDITY: I don't have the impression that humidity level is likely to be critical, though judging by the sorts of places where it's grown outdoors, I would assume that humidity is good if you can get it. TEMPERATURE: A number of outdoor-gardening sites claim these are hardy to about 30F (-1C) outdoors, and they don't seem to have an unreasonable upper limit either, so temperature shouldn't be a concern for indoor growers. Davesgarden.com gives them the thumbs-up for zones 9b and higher, so some outdoor growers probably don't need to worry about temperatures either. Work plant with new stolons; this was a newly-potted single offset less than six months ago. PESTS: Have yet to see any, but would not be surprised by scale or mealybugs. GROOMING: Almost non-existent. Dead leaves, dusting, maybe the occasional removal of hard water spots or something like that. FEEDING: Don't, if the plant is outside. If inside, you may have to eventually, but I certainly wouldn't use full-strength, or even half-strength, fertilizer. PROPAGATION: Remarkably easy. Sever the stolons your plant will inevitably produce and root them in unchopped sphagnum moss, or sphagnum and potting soil in a 50-50 mixture. Using straight potting soil, which stayed too wet for too long, was my problem with one of the two in the orange-and-green photo above. Rooting is quick, and about six months after that you should have the beginnings of new stolons. New stolon on my plant at home. The basic plant isn't the most fascinating thing. It changes colors, it's naturally very shiny (I've actually had customers say they weren't interested in it on the grounds that it looked artificial.7), it spreads and propagates well, and that's about the extent of things. 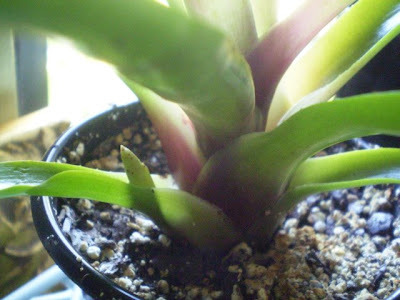 However, it's also a good plant for creating hybrids: the spreading habit (which doesn't seem to be all that common among bromeliads) comes through often enough to make for more easily-propagated, spreading bromeliads (see links 1, 2). There are also a couple of cultivars, which are slightly more interesting: one is variegated and the other is slightly larger than 'Fireball.' (You can see them both for sale here; I do not know this company and do not vouch for it, so caveat, as always, emptor.) One site makes the claim that there are over 150 named clones of 'Fireball;' it's difficult for me to imagine how there could be that many distinct variations on this one theme, but that doesn't mean anything: there are lots of things I find difficult to imagine. A surprising number of sites I stumbled into made reference to the difficulty of getting 'Fireball' to flower; people who'd been around them for years were complaining about the impossibility of getting a flower to cross-pollinate. This strikes me as very strange, since blooming was one of the very first things ours did when we got them off the truck in March. It never even occurred to us to try to make it happen. And, while it's true that the plants may have been set to bloom before we got them, we've seen several other flowers in the subsequent seven months. So I don't think they flowered because of any treatment they received in Florida; they're just not that hard to convince to flower. I wish I knew what, exactly, it was that we'd done that everybody else was failing to do. Photo credits: Picture of Dorothy is from shawnnacox.com; all others are my own. 1 Usually with respect to purchasing plants, as opposed to writing about them. But the writing part happens too, occasionally. 2 One site mentioned overfeeding as a possible reason why specimens might stay green; I didn't see this anywhere else, so I'm not sure how seriously to take it, but it could explain why two rosettes getting the same amount of light, sitting right next to one another, can end up different colors. 3 It stays in the window anyway because, despite desperately needing to rearrange all the plants and put them in better, more culturally and aesthetically pleasing spots, I don't have room to put all the plants temporarily while I sorted out where everybody should be. I could move 'Fireball,' but if I move 'Fireball,' then I'll have to move plants B and C, and then they'll displace D, E, F, G and H, and then they'll bump aside I, J, K, L, M, N, O, P, and B again (me having realized in the meantime that F really actually needs to go where B was), and so on and so forth until I've got plants wandering all over the apartment, packs of refugee Dieffenbachias from the kitchen trying to start a fight with the Saintpaulias in the living room, the Dracaena deremensis 'Warneckei' pleading for order in the midst of it all, Aglaonemas looking down on the whole mess disappovingly like the Pope, and inevitably somebody's going to get knocked over and lose all their soil. So for the time being, even though the current arrangement is far from ideal, there will be no large, sudden relocations. 4 Perhaps a Lifetime movie, with a good woman (Cynthia Stevenson?) teaching a gruff, damaged but nevertheless hunkalicious widower (Dylan McDermott) how to love again, plus an optional brush with a non-disfiguring form of cancer. 5 As explained at the link, just because a plant has an incomplete Latin name and is identified by an English name, that doesn't mean it's necessarily not a species. It may, as in this case, just mean that people haven't yet been able to agree on a specific Latin name, or that there's some kind of hold-up with the official written description or type specimen, or that the origin is disputed, or who knows what all else. Provisional names don't usually last for forty years, granted. But they're not necessarily hybrids, even so. 6 If it's an eerie, luminous purple, it's angry. Leave your home immediately. Get to a safe location and crouch with your hands covering your head and neck until instructed otherwise by a public safety official. 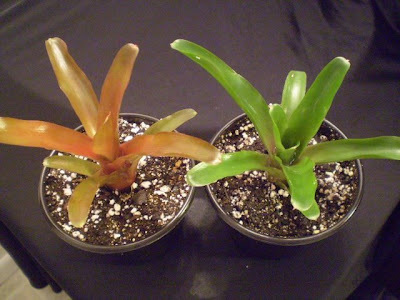 7 Alas, the reverse is never true: no customers reject artificial plants because they look too real. 8 Though I have an amazingly hard time convincing customers of this. I think the problem is that when they hear me say that the parent plant dies after blooming and the offsets can be potted up separately, they either stop listening entirely after "dies," or they stop listening when I say "potted up separately" because potting things up sounds like too much work. Either way, at some point they generally stop listening. 9 Just so you know: I tried desperately to work in a ruby slippers and/or Emerald City reference, both of which seem like they'd be easily done in a post about a plant which is variously red and/or green, but to no avail. Nothing sounded right. Something will occur to me about twelve hours after the post goes public, though. Wow -- this is an incredibly informative post! VERY interesting! This makes me want to give bromeliads another try. What happened with the first try? Greetings, Mr. Subjunctive. You've once again lured me into reading all the way through a long post about a plant I'll probably never own. How do you do it? Anyway, in honor in part of that ability, I've left you an award. Details at my blog. Neo. 'Fireball' is also a staple in dart frog vivariums due to its size (small enough to fit in a mid-small tank), bright colour (under fluorescents) and that it holds water in the axils and cup for them to deposit their tadpoles - which may actually have something to do with how the flowers get fertilized in nature. (I'm sure you found many pages referencing this while you were researching this plant!) They also do well with very high humidity (80%+) but also seem to do well in normal room conditions. On the subject of plant fertilization... in the planted aquarium world red colours can be brought out by 1 - very high light 2 - high iron/trace minerals in general and 3 - keeping nitrates (and phosphates I believe) very low. Conceivable that this could be similar with N. 'Fireball' as well where minimal fertilization (nitrogen specifically) would improve the colour.